Researchers: Erik Sturkell, Freysteinn Sigmundsson, Rikke Pedersen, and Halldór Ólafsson, Nordic Volcanological Center, Institute of Earth Sciences, Iceland; Kristján Ágústsson, Icelandic Meteorological Office; Alan T. Linde and Selwyn I. Sacks, Department of Terrestrial Magnetism, Carnegie Institution of Washington; Páll Einarsson, Institute of Earth Sciences, University of Iceland; Halldór Geirsson, Icelandic Meteorological Office and Pennsylvania State University; Peter C. LaFemina, Department of Geosciences, Pennsylvania State University. 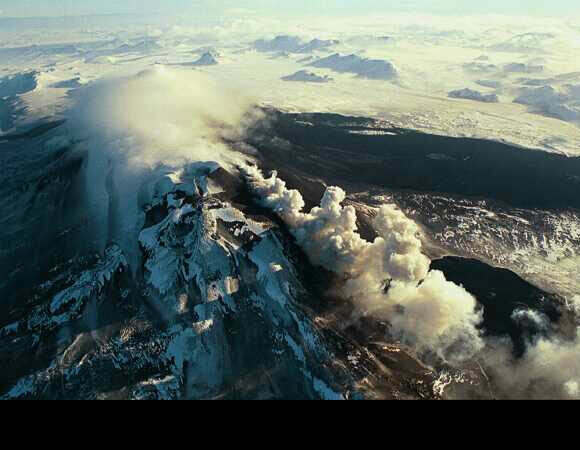 Hekla Volcano in Iceland is very active, building up an 800-meter high mountain of lava above its surroundings. 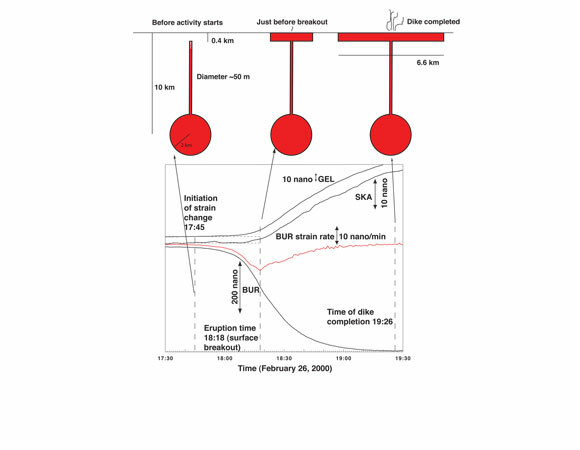 The time interval between eruptions varies from 10 to 250 years. Since 1970 the time between eruptions has been about 10 years.. Deciphering the magma body below the surface that is causing all of this activity is key to hazard mitigation and understanding how volcanoes work in a complex tectonic setting. In a recent paper, Sturkell et al. (2013) use borehole strain data, campaign GPS, InSAR imaging, and optical leveling tilt measurements, to model the magma body. During an eruption, a shallow dike delivers magma to the surface (i.e., surface fissuring). A model of the deeper part of the volcano suggests the near-surface dike is connected to a deeper and larger magma body at 10 kilometers depth or more by a thin vertical tube. The vertical tube is filled with molten magma that does not solidify, which keeps the system erupting on a more frequent recurrence time. Hekla Volcano sits on a rift zone in southern Iceland where two tectonic plates are spreading apart (i.e., the North American plate is separating from the Eurasia plate at the Mid-Atlantic Ridge) and over a hot spot plume that extends into the mantle. Not only is Iceland spewing out tons of magma from these thermal structures, but it also has lots of earthquakes associated with magma and plate movement. Determining shallow structure in the crust is difficult because of mixing of magmatic and tectonic processes. Using an array of geodetic tools that monitored the last major eruption of Hekla volcano in 2000, the sequence of magma flow to the surface and the shape of the deeper reservoir, vertical conduit and shallow dike were determined. Figure 2. 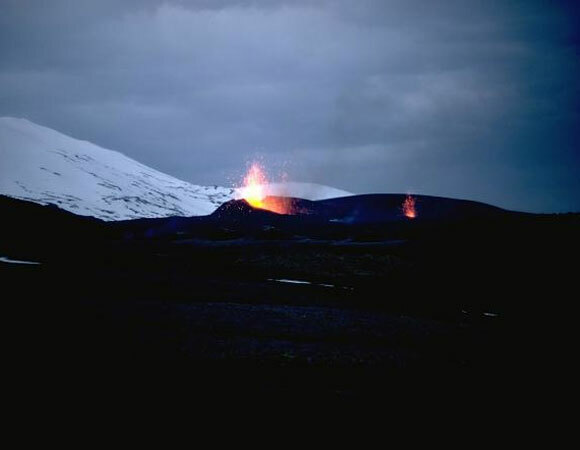 Hekla eruption 2000 - Photo: Sigurjón Sindrason. Photo from Universitatis Islandiae Sigillum Institute of Earth Sciences. Figure 3. 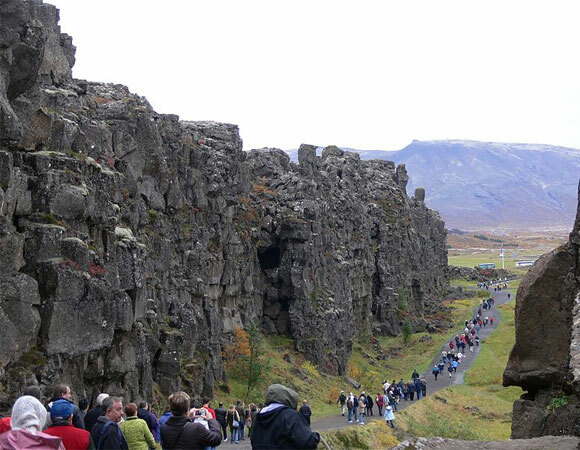 Rock outcrop in Iceland, a visible surface feature of the Mid-Atlantic Ridge. 30 September 2006. Photo by Wikimedia user Pmarshal. The model by Sturkell et al. (2013) starts with a shallow and elongate dike as constrained by GPS data of horizontal surface motion as the dike expands during an eruption. The modeled deep reservoir (i.e., 10 kilometers or deeper) with a spherical or sill-like shape is constrained by the uplift pattern of reservoir inflation in a pre-eruptive InSAR image, strain data during the first 4 hours of the eruption when the reservoir contracts as magma rises up, and tilt change at the surface of the volcano during the eruption. Connecting the dike to the reservoir is a narrow vertical tube that because of its size is probably filled with magma that does not solidify between eruptions. The geometry of the magma body explains the change in Hekla’s eruption cycle from eruptions more than 60 years apart to an eruption every 10 years since 1970. 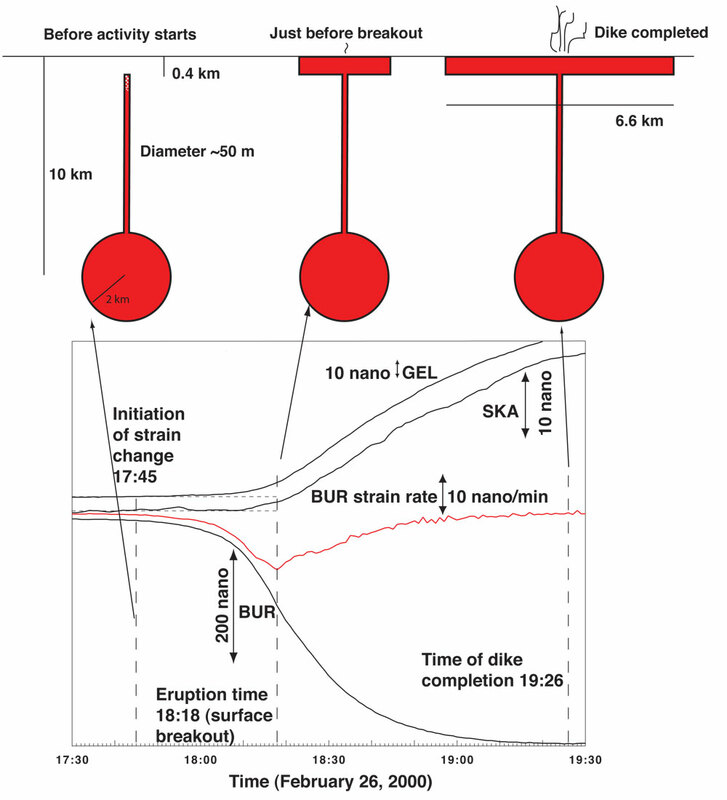 The thin, hot, magmatic tube is feeding the shallow dike with magma more often, leading to smaller but more frequent eruptions compared to activity before 1970. . Other recent geodetic studies of Hekla, including a detailed GPS study by Geirsson et al. (2012) and an InSAR study by Ofeigsson et al. 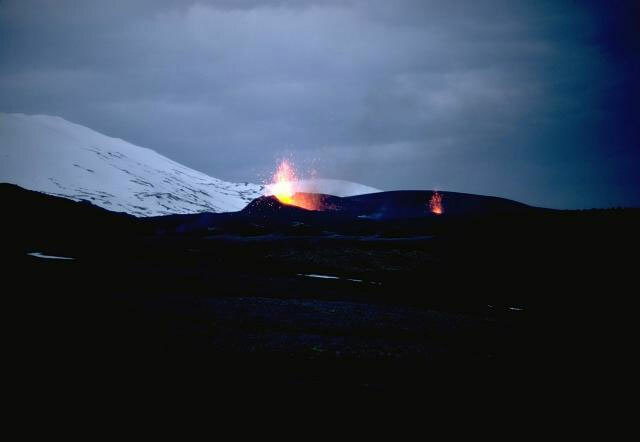 (2011) are compatible with this model and offer significant additional insights into the magmatic plumbing beneath Hekla and other Icelandic volcanoes. Erik Sturkell, Kristján Ágústsson, Alan T. Linde, Selwyn I. Sacks, Páll Einarsson, Freysteinn Sigmundsson, Halldór Geirsson, Rikke Pedersen, Peter C. LaFemina, Halldór Ólafsson, New insights into volcanic activity from strain and other deformation data for the Hekla 2000 eruption, Journal of Volcanology and Geothermal Research 256,78–86, 2013. 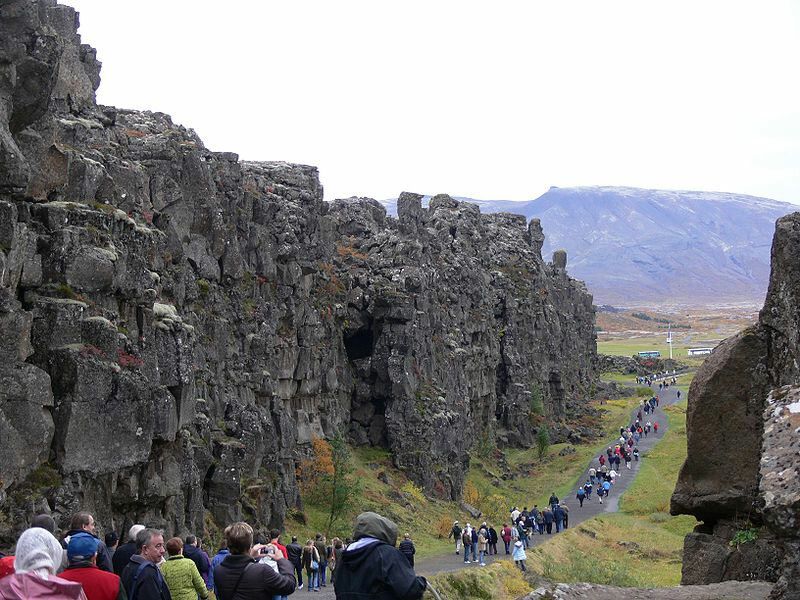 Halldór Geirsson, Peter LaFemina, Thóra Árnadóttir, Erik Sturkell, Freysteinn Sigmundsson, Matthew Travis, Peter Schmidt, Bjorn Lund, Sigrún Hreinsdóttir, Rick Bennett (2012), Volcano deformation at active plate boundaries: Deep magma accumulation at Hekla volcano and plate boundary deformation in south Iceland, J. Geophys. Res., 117, B11409, doi:10.1029/2012JB009400, 2012. Ofeigsson, B. G., A. Hooper, F. Sigmundsson, E. Sturkell, and R. Grapenthin (2011), Deep magma storage at Hekla volcano, Iceland, revealed by InSAR time series analysis , J. Geophys. Res., 116 , B05401, doi:10.1029/2010JB007576.